I just found this review in my unpublished drafts. I was confused though, I could have sworn I had published this. And then I realized that there are two companies, both of whom make similar snack bars, with nearly identical names: Be Natural (which I did review before, and enjoyed) and Go Natural. Be Natural is from Australia, and ... so is Go Natural. As you might have guessed, they try to make more natural, healthy snacks. Their tag line is "Goodness Tastes Better". They are gluten-free. They make a number of product lines, including packaged nuts and seeds, savory spicy snack bars, fruit and cacao bars, and nut based bars, including an entire section of macadamia based bars. I tried several bars while in Sydney. "The goodness of nuts in the original healthy snack bars." Nut Delights come in a lot of varieties, all based around nuts and seeds, with different fruit mix-ins and coatings. I know I tried other varieties, but I seem to only have notes on the simple classic Fruit & Nut Delight bars. "Our Fruit & Nut Delight combines almonds, walnuts, peanuts, sultanas, apricots, and apple sweetened naturally with Australian honey." This was a classic granola bar. Chewy style, kinda sticky, loaded with lots of different nuts and fruits. I give them credit for having so many types of nuts and fruit in it. The honey was a different touch than most granola bars, a lovely sweetness. 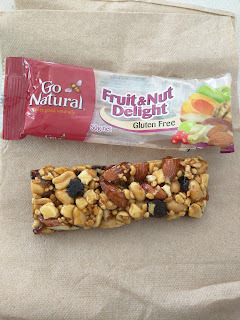 I liked it more than most granola bars, but it was still just a granola bar, and, it had a bitterness to it on the aftertaste that I didn't enjoy. 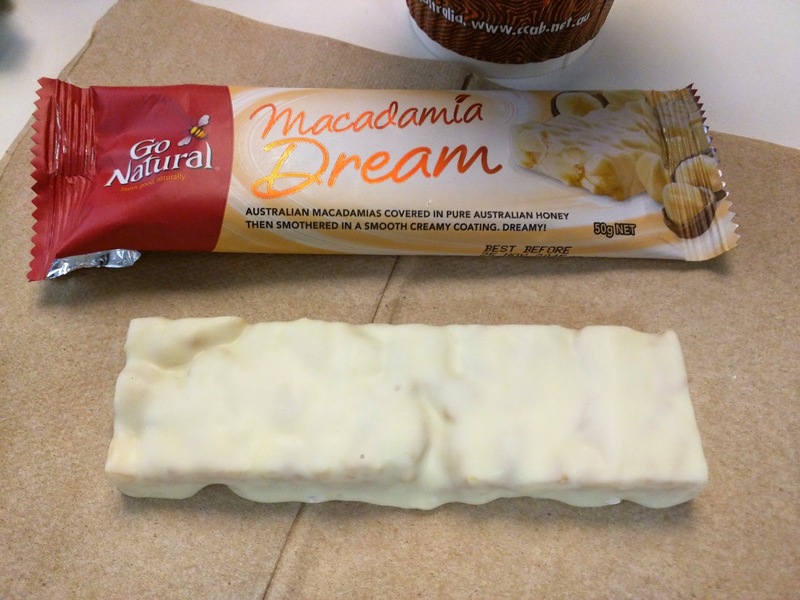 "Naturally indulgent Australian-grown macadamia bars." Macadamia based bars are their own line, again with different mix-ins, and different coatings. "Our Macadamia Dream is the perfect natural indulgence. Luxurious Australian-grown macadamias are lightly roasted to enhance their richness, then sweetened with fragrant Australian honey and smothered in a creamy yoghurt coating. Dreamy! This was very, very sweet. I like macadamias. I like honey. But this had way too much honey flavor. It totally masked the macadamias, and, macadamia and honey is a bit of a strange combination in the first place. Then there was the coasting. What was it? Sweet yogurt? White chocolate? I’m not sure. 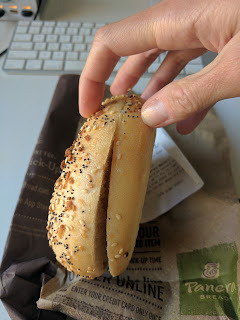 I really didn’t care for this after more than one bite. It has been a long time since I've written about the Alexander's family of restaurants. Going to the Alexander's Steakhouses, in Cupertino and Mountain View really is what turned me into a bit of a foodie (and, ok, a bit of a monster for a while during the foie gras ban days). 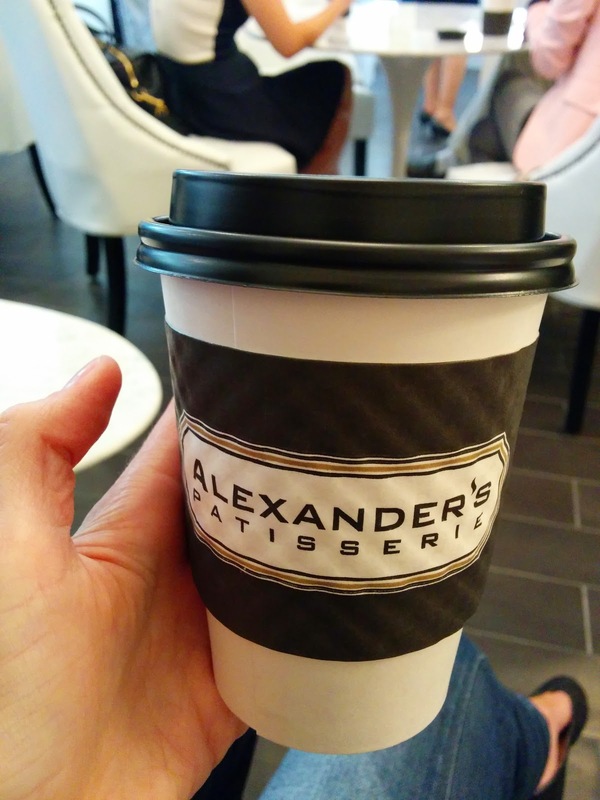 "Alexander's" was one of the first labels I added to my blog, which I added explicitly because I was writing about the same place so often. I still visit the San Francisco Alexander's Steakhouse a couple times of year, although now I reserve it for special occasions. Since I last wrote though, the restaurant group has radically expanded. The original location in Cupertino moved. They opened more steakhouses; in Pasadena, Tokyo, and Taipei (!). They introduced a seafood focused restaurant, The Sea, in Palo Alto (which makes so much since given how often I rave about the seafood dishes at the steakhouse!). And ... they opened a patisserie (ok, two now, one in Mountain View and one in Cupertino). Oh, be still my heart! Yes, my favorite restaurant group opened a pastry focused establishment. They brought in a very accomplished pastry chef from Belgium, who worked at the famed Pierre Herme in Paris (which of course I've reviewed), and Joel Robuchon in Las Vegas. Let's just say I was excited to try it, particularly after the accolades started rolling in. I still haven't actually been to the store while in operation, but I've tried their treats on several occasions. I now know, definitively, that I need to go to the store. 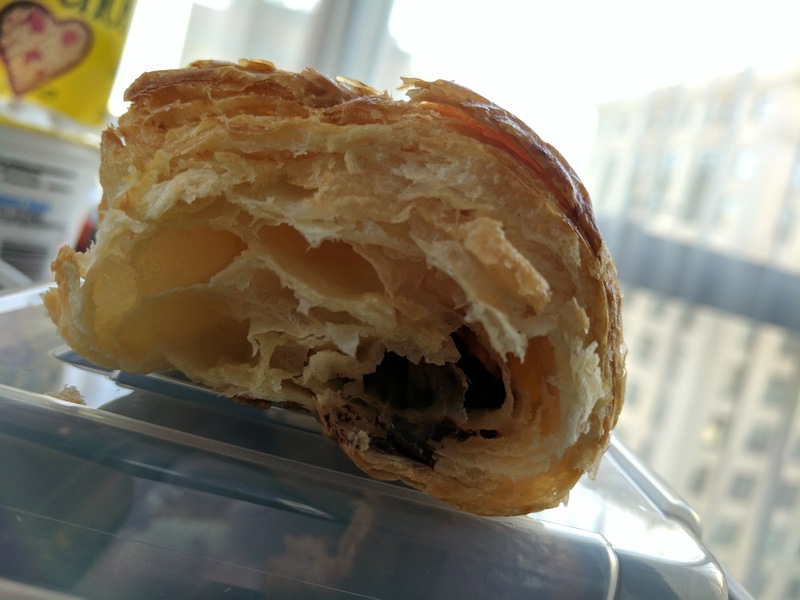 I *need* to try their kouign amann, and I need to try their banana chocolate croissant. This place, as expected, has quality products. I gleefully accepted an invite to the pre-opening, even though it was in Mountain View. But ... quasi-disaster stuck. I went all the way down to Mountain View to find that ... their final permit did not come in in time. They couldn't use the kitchens yet. Doh. They served coffee and macarons, and showed off the space, but, they weren't able to offer anything else. 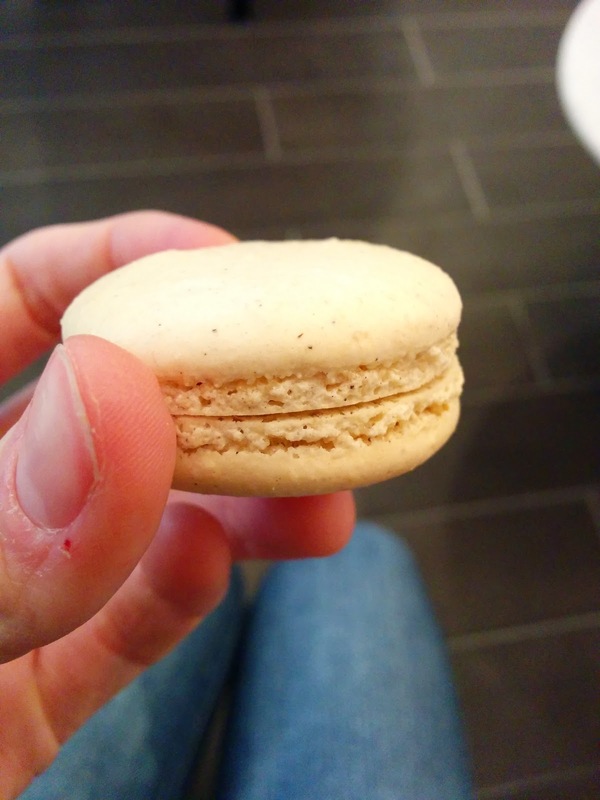 The coffee was fine, and the macarons were all decent (good cookies with slight give to them and proper chew), but, macarons are really not my thing, and I'll admit, I was pretty sad. They served Equator Coffee at the time, but have since moved to Stumptown. I had decaf. It was strong, dark, and particularly good for decaf. I started with the coffee macaron, filled with coffee ganache. 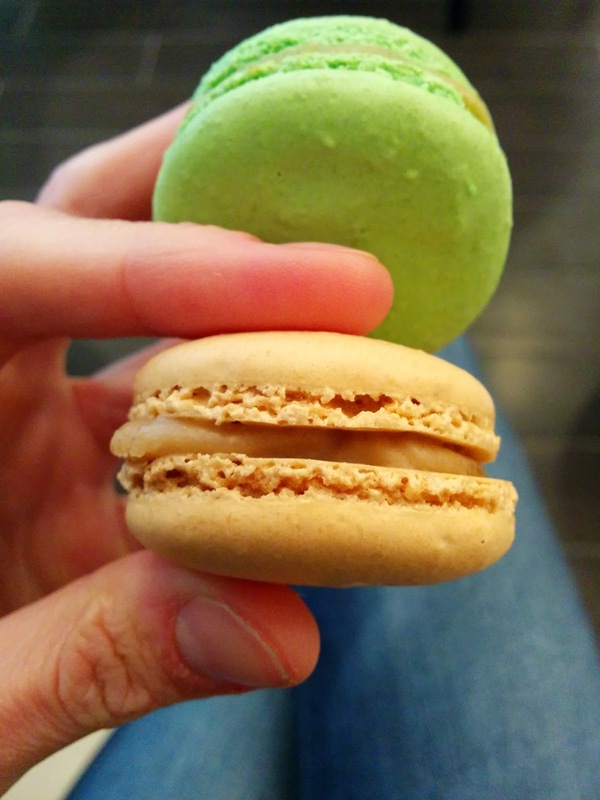 This macaron somehow made coffee taste delicate. It was clearly coffee flavored, but in a really light way. My third favorite variety. 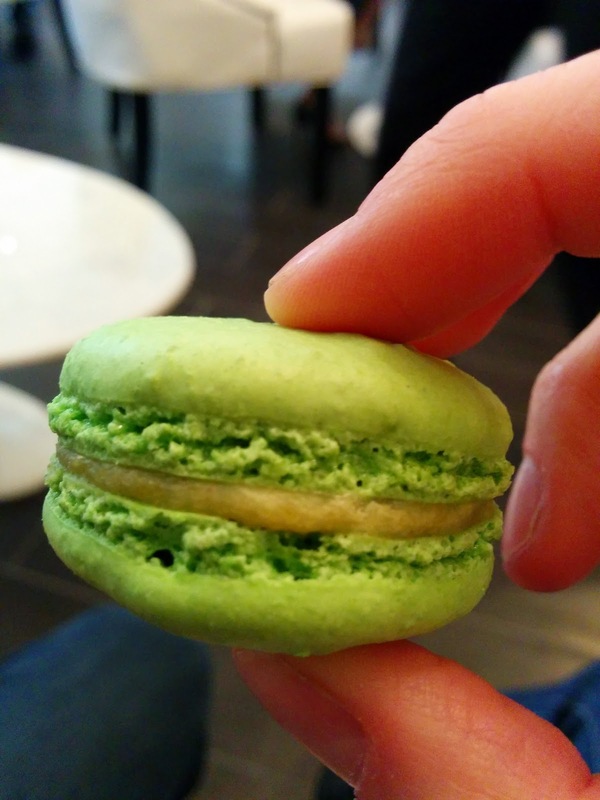 Next I had a pistachio macaron, filled with toasted pistachio ganache. It was a beautiful green color, with decent pistachio flavor throughout. My forth favorite. Next came a chocolate ganache filled macaron, with in it nibs too. I loved the rich, dark chocolate ganache filling. The cookie was slightly chocolate flavored. My second favorite, and I really just wanted to eat a big bowl of the filling. And finally, simple vanilla, with Tahitian vanilla bean ganache inside. It was my absolute favorite. Super sweet filling, it reminded me of frosting, but I really did like the sweetness. 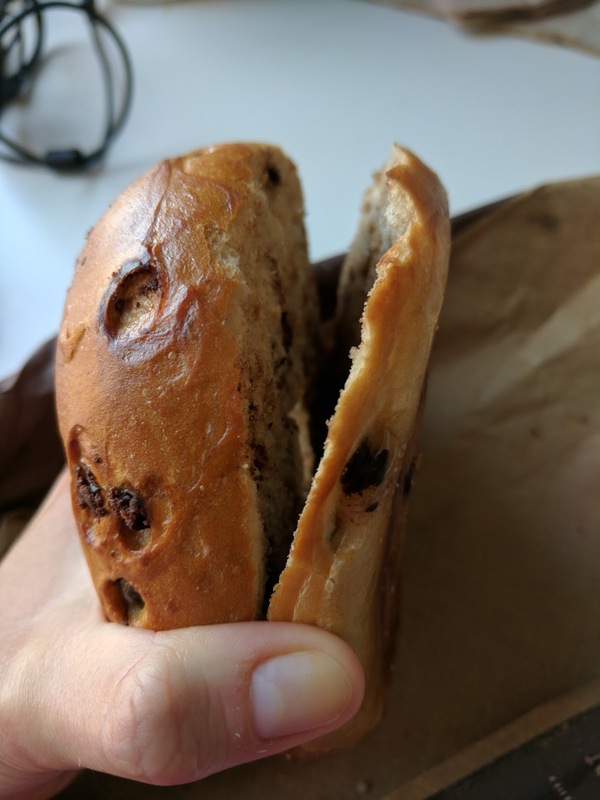 The thick filling was balanced by delicate cookies. Lavender is a flavor I don't generally like, so I didn't take one myself, nor take a photo. 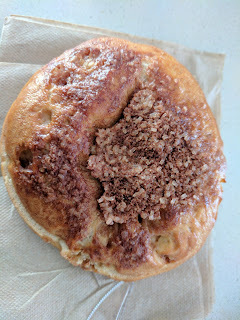 But I couldn't help myself from stealing a bite of Ojan's when he had one in his hand, it was such a beautiful light purple color. 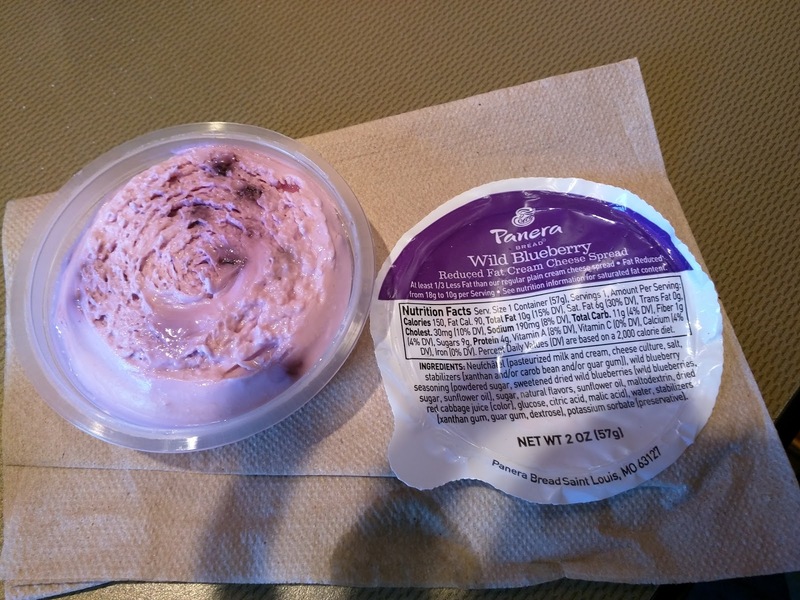 I don't generally like lavender flavors, and this was no exception, but, if you like floral desserts, the flavor was nice, and fairly subtle. Second to last favorite though. Another flavor I don't tend to like is passionfruit (although I love the real fruit!) so I only took a bite of Ojan's, hence no photo. Very strong quasi fake passionfruit flavor, which, predictably, I didn't like. Least favorite. 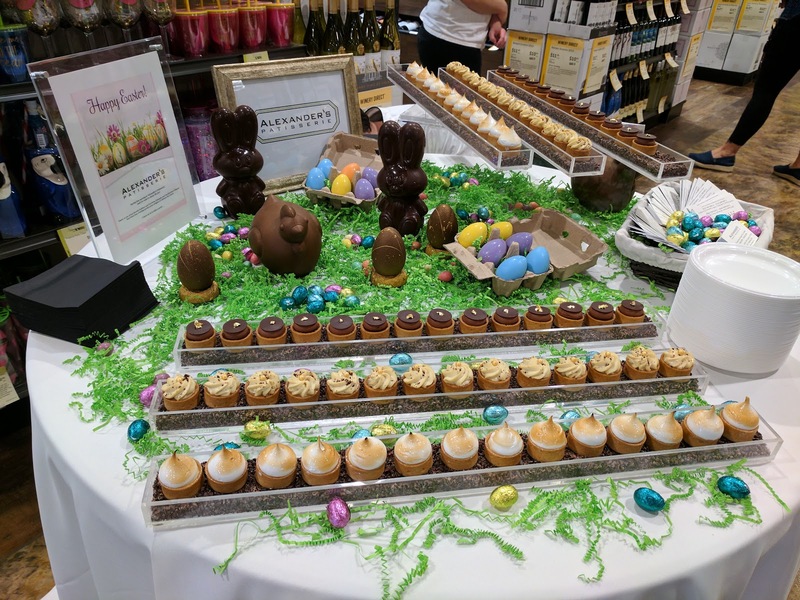 In April, I was invited to a pre-opening event for Total Wines & More, in Mountain View. I was there to admire the store and sip on wine, and, let's be honest, I was excited to check out the food. 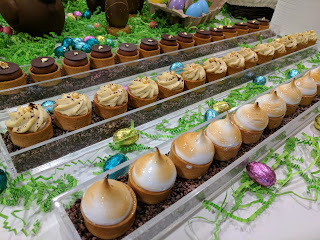 Savory bites were provided catered by places ranging from Michelin starred Chez TJ to casual Pokéworks, but my eyes were on the Alexander's Patisserie table from the moment I walked in. It took a lot of restraint to wait to go for the sweets until after I had some savories first. 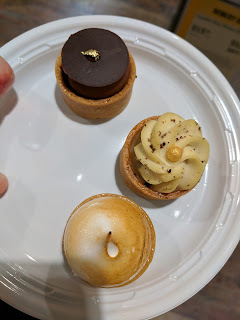 Their offering was mini tarts, beautifully presented perched on top of a "soil" of cocoa nibs, in clear glass "planters". It might sound tacky, but really, it wasn't. The crew did an impressive job of keeping the display perfectly stocked throughout the event. While other tables ran low, they never did. I guess I expect no less from an Alexander's establishment, but they were true professionals, and, I believe the head pastry chef himself was there at the event. I have a confession though - just like I don't really like macarons, tarts aren't really my favorite either. I like pie crust, I like puff pastry, I like many other vessels for fillings, but, tart shells? Meh! So, I wasn't thrilled to see tarts as their item offered. The tart shells were about as good as a tart shell is going to be. Buttery, nice texture, a bit crumbly, not too hard. And at least they tasted like something. As Ojan put it, "you don't need to just eat the insides out of them". But let's talk about those insides. Spoiler: swoon! On my first round, I tried all three. Yes, all three. And yes, I said my first round. I'm sorry, I like my sweets! In my defense, I *did* ask if it was ok when I went back for seconds. The tarts were too good to listen to social norms about acceptable levels of consumption. Chocolate Tart: cocoa nib praline / 66% dark chocolate ganache. Those who have been reading my blog for a while might notice something here. Chocolate. I don't eat chocolate at night (caffeine). I rarely make exceptions. I don't even really care for chocolate desserts that much (but, I *always* have dark chocolate in the morning alongside my coffee). So, I wasn't excited for the chocolate one, really. Still, I knew my opportunities to try Alexander's Patisserie were limited, and I wanted to make the most of it. 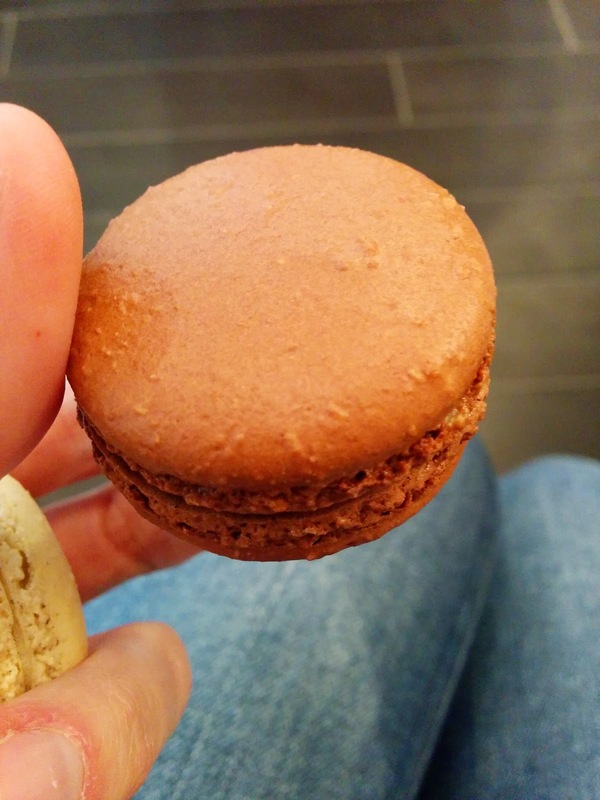 It was glorious, just like the chocolate filling in the macaron. The base layer had cocoa nibs in it, a surprise to me, wonderful bits of crunch. On top of that was dark, thick, decadent chocolate ganache. I'd say that I'd love to eat a whole bowl as pudding, but actually, it was too rich to want to do that. Maybe a *small* bowl, with some whipped cream on top? 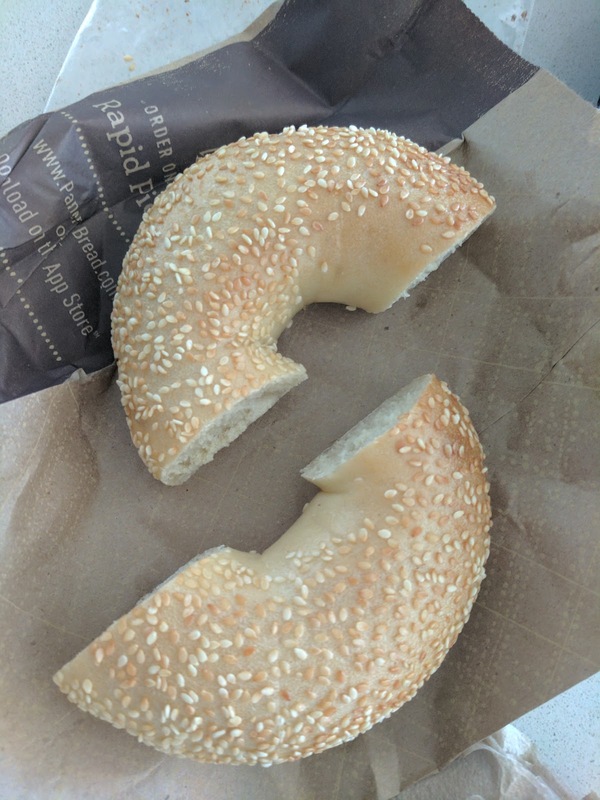 Anyway, the amount here was just right, and it was a fantastic bite. It had a cap of more dark chocolate and a touch of edible gold leaf for some bling. My second favorite. Vanilla Tart: Tahitian vanilla ganache / vanilla mascarpone cream. Anyway, the vanilla ganache was a thing of wonder. It was thick, sweet, and intensely vanilla flavored. I'll be honest ... I didn't think vanilla *could* taste this good. It was incredibly rich, even more than the chocolate. There is no way you could have a bigger bite of this. On top was vanilla mascarpone cream, also glorious. Also wonderfully vanilla flavored, also sweet and rich, and somehow complimentary to the ganache. How does one rich sweet vanilla element compliment another rich sweet vanilla component? I don't know, but, it did. One could take three bites to eat each of these, if he or she had restraint. And I did, the first time, as I didn't know it would be so wonderful. But when I went back for another, it was all I could do not to eat it in a single bite. I settled for two wondrous bites, knowing I'd actually appreciate it more that way. Lemon: lemon cream / lemon zest / lemon segments. And finally, lemon. I almost didn't take this one, and really, I shouldn't have. I do not like lemon desserts. And this ... well, it was a lemon dessert. The lemon cream tasted like lemons. I did not like that. However, the meringue on top was excellent, sweet, fluffy, light, airy. 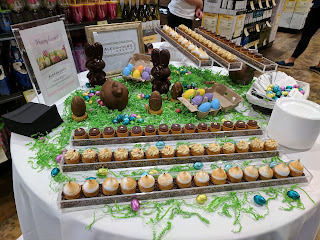 And I give them kudos for the perfect execution of the toasting of each and every one, and the fact that these delicate treats were not damaged at all in their display! Still, I wouldn't want another of these. I did not grow up with noodle kugel. I didn't even know it existed. A major downside of growing up in a small rural town with zero diversity. This makes me sad, as, it turns out, I really enjoy it. The first noodle kugel I ever had was from Wise Sons, a cold sweet version, served with seasonal jam. I ordered it because I was fascinated by the idea, and I knew it sounded like something I would like: I love casseroles, puddings, bread puddings, and things with crispy tops. Since then, I've had several savory versions too, such as spinach noodle kugel, and parmesan sour cream potato kugel topped with tomato sauce. I still find all variations fascinating, and I never quite know what to make of them. Savory versions seem like they could be side dishes or mains. Sweet ones seem equally suited for breakfast or dessert. Should I eat it warm, or cold, or either? What about extra toppings? I always want to drizzle some maple syrup on sweet versions at breakfast. Am I really eating sweet mac and cheese? I wish I had more exposure to these items growing up! This recent adventure was with a sweet breakfast kugel. I had extra, and you know me, if there is any chance of crispy bits enhancing something, my mind immediately jumps to waffling it (if you don't know what I'm talking about, go start with my master post). So, Leftover Noodle Kugel: Will it Waffle? Sure. The Original: Blueberry Cream Cheese Kugel. 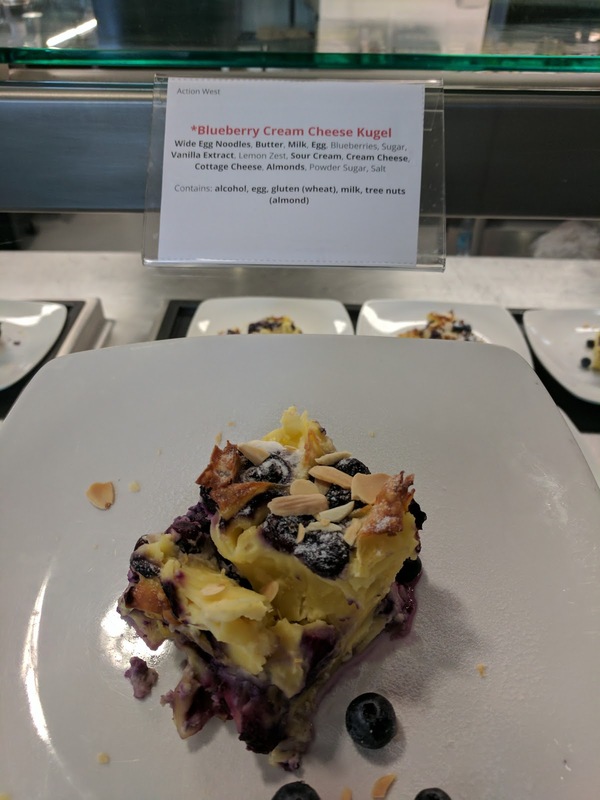 The original was absolutely delicious sweet noodle kugel, served at my office for breakfast. 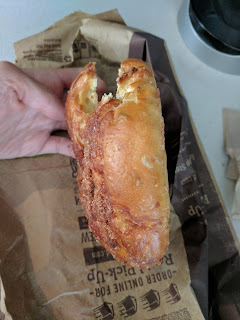 It was creamy inside, with sour cream, cream cheese, and cottage cheese mixed together to create pockets of slightly tart cheesiness. It was perfectly moist and custardy inside, but had crispy bits on top from sliced almonds and noodles themselves. Studded throughout with juicy blueberries. Accented with lemon zest and vanilla for a bit of extra complexity in the flavor. Dusted with powdered sugar and topped off with fresh blueberries. It was very, very good, and served in giant slices. 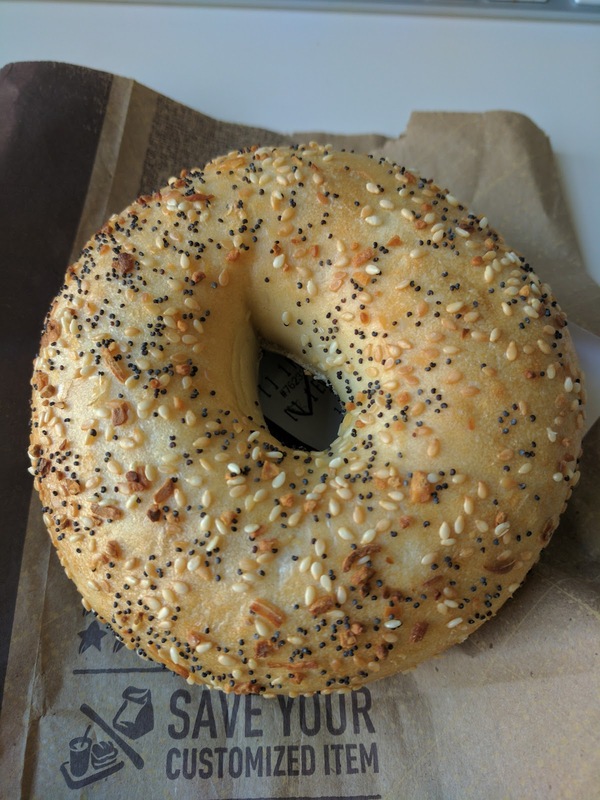 I polished one off in an instant, alongside a few other breakfast items. I realized that one slice was bigger than I needed even, but I wanted more. I took a second slice. I started in on it. And then my stomach caught up with me. But, I certainly did not throw it out. Into the fridge my leftovers went. I tried a few bites cold, and it was perfectly tasty. I'm sure it would have been fine simply reheated in the toaster oven too. But I saw an opportunity to experiment, and I couldn't resist. 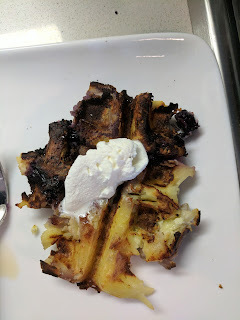 Inspired by the crispy bits on top that I liked, I schemed to get more crispy bits, by waffling it, of course. 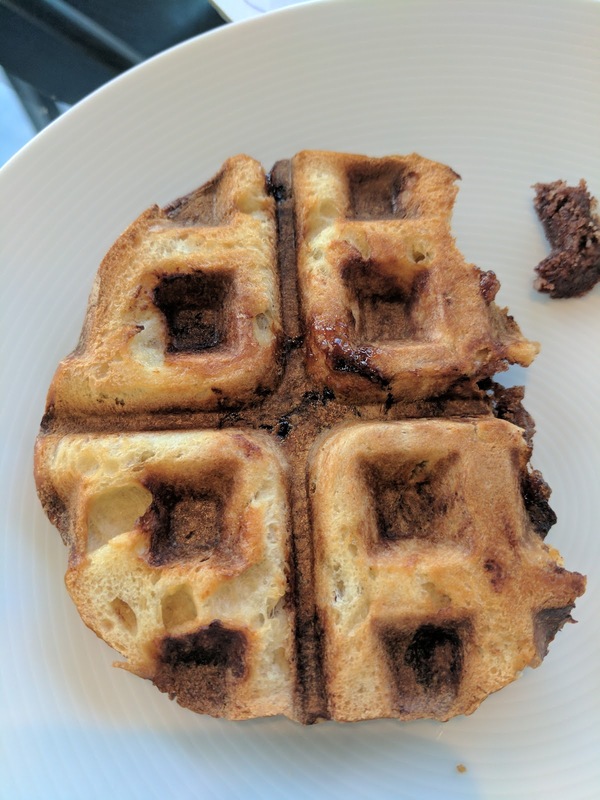 So into the waffle iron a chunk went. Simple setup, 350 degrees. No extra crusting or work done, although I think this would have lent itself nicely to crusting with some cornflakes, or a sugar coating to caramelize on the outside. It cooked easily, no drama. I held form well, extracted easily, made no mess, didn't burnt. Waffled Blueberry Cream Cheese Kugel. The result was basically what you'd expect. Crispy noodle edges, all around. Still fairly custardy inside. 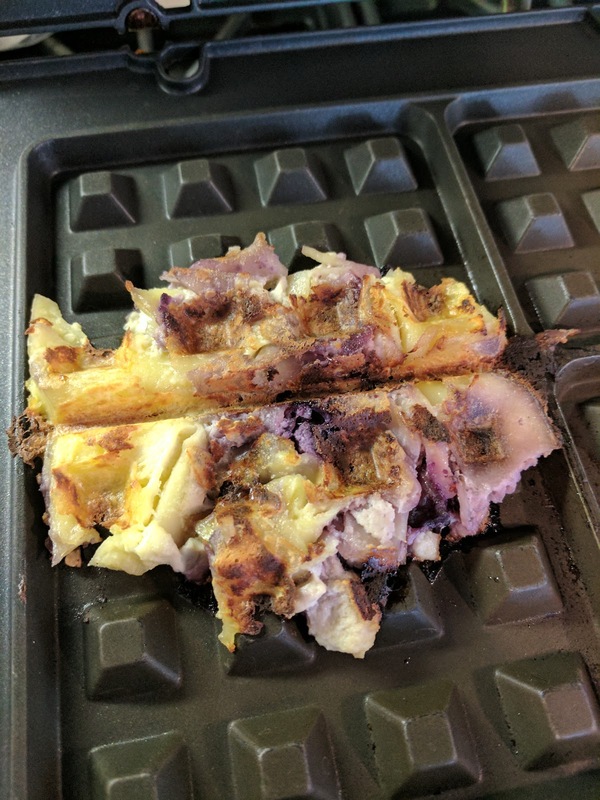 I don't see it as a radical improvement on traditional reheating, or even eating cold, but overall, it was absolutely fine, and if you like crispy bits on your kugel, you'll like this. Start with my original review from July, where I discovered their fantastic baked goods, then, return here. 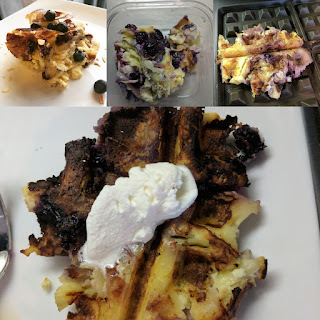 Banana Bread Pudding French Toast. $17. "Vermont maple syrup and white chocolate. Served with fresh berries and banana." 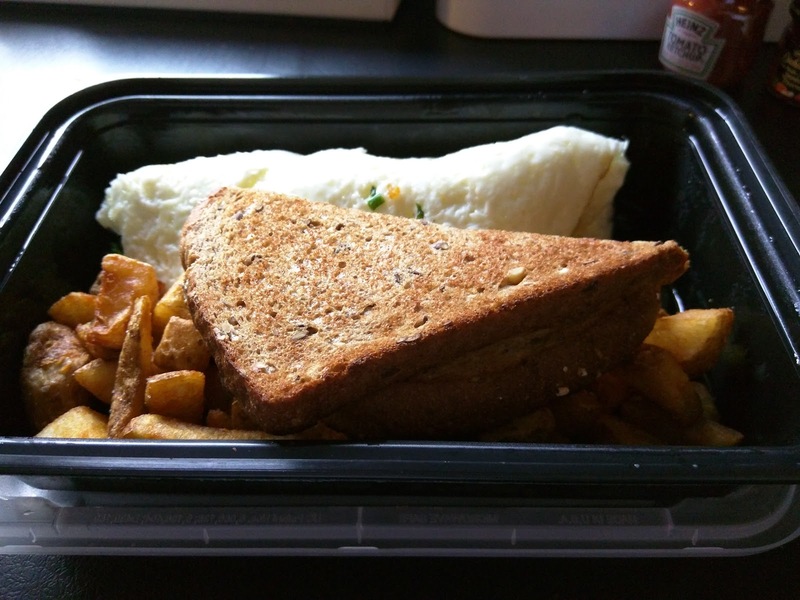 My order arrived fairly quickly, 2 slices of french toast, made from banana bread as expected. It was covered in shaved white chocolate and served with a little pot of maple syrup on the side and a pile of berries and bananas. The fruit wasn't particularly good, just as my previous visit. Not bad, but, it was December, and it certainly wasn't local or flavorful. The white chocolate added a ton of sweetness, and melted in, and of course I liked that. 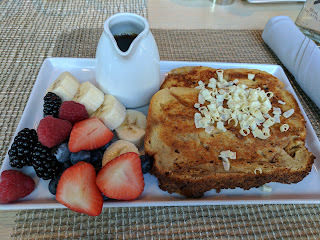 But the french toast itself ... that was kinda meh for me. 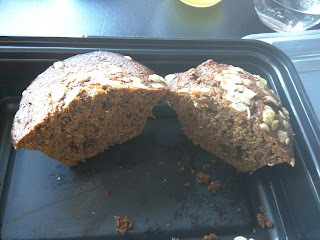 The crusts were hard, and it was, well, banana bread. It was nicely moist and fairly fluffy though, I suspect this is what made it "bread pudding french toast"? It was fine, but, it didn't scream "bread pudding" in the way I was hoping, and I wouldn't get it again. Muffins (Banana-Nut, Blueberry, Bran), Pain au Chocolat. $6 each or 3 for $13. 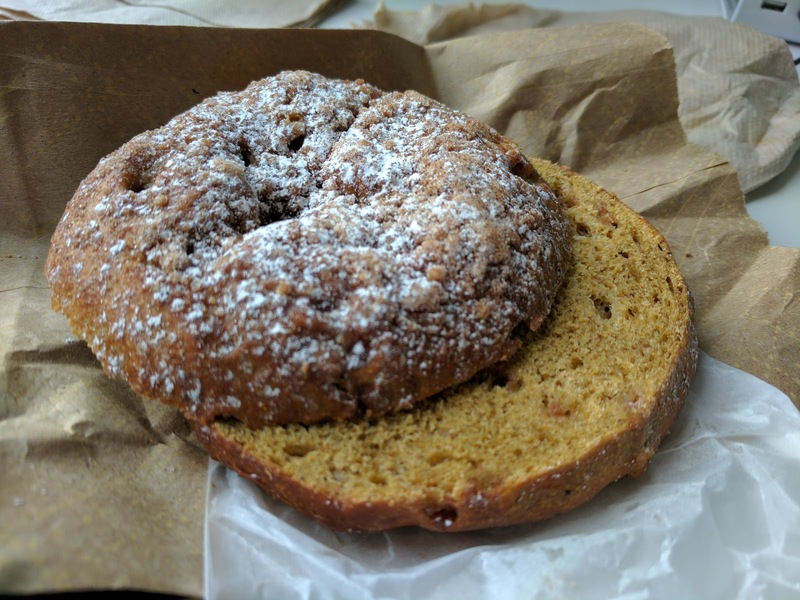 After my lackluster french toast, and the uninspired breakfast menu, I went back to what I knew was good: the baked goods. I got them as a "pastry basket", and took togo. 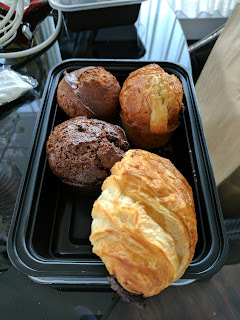 I opted for one of each of the three types of muffins, plus a pain au chocolat (other options for pastries are just a regular croissant or assorted bagels). I enjoyed all of these during my last visit. The bran muffin turned out to be my favorite this time. 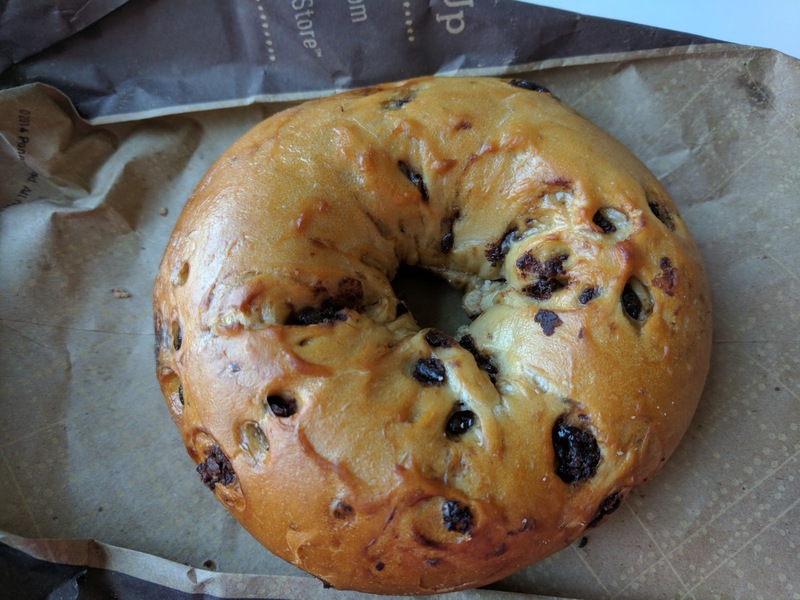 Dense, loaded with plump raisins, hearty. I had it at room temperature, but I think it would be great warmed, and even better buttered up and slathered in jam (they did provide me with Dickinson's grape jelly and strawberry preserves). The blueberry was again loaded with blueberries, and I liked the flavor in the base. Interestingly, the banana nut was my least favorite this time, even though I had liked it the most last time. I really just wasn't into the banana flavor, not that I ever really am. I did like the nuts. As before, the baked goods are available for $6 each, or a "Pastry Basket" of 3 for $13. I clearly got a pastry basket (one of each muffin! 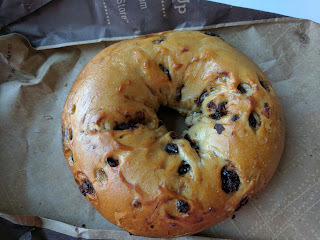 ), but still had some allowance left on my daily breakfast, so I added in a pain au chocolate as well. I added the chocolate croissant, er, pain au chocolat, mostly because I had more $$ I could spend in my credits, but also because chocolate sounded really good at the time, and I knew they make a decent croissant. Which, they did. Look at the loft! The layers! It really was nicely layered, crispy on the outside, moist on the inside. 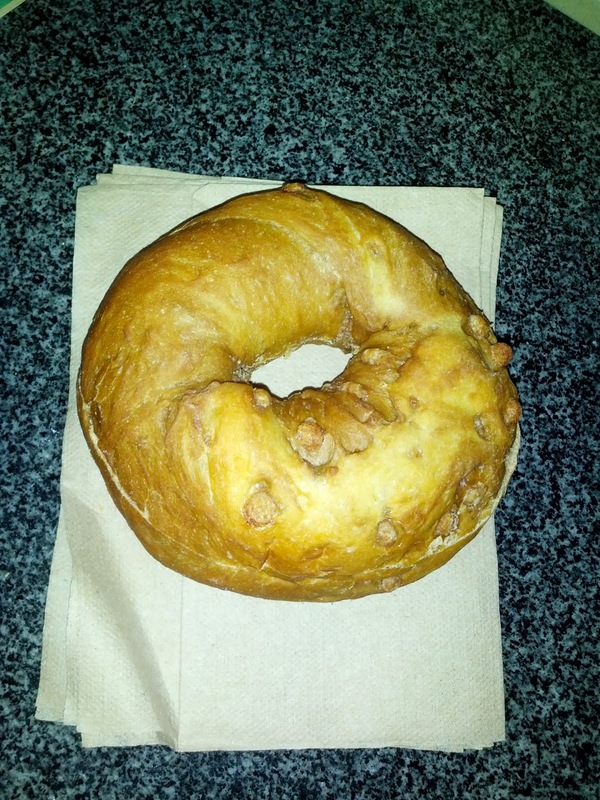 But the pastry dough didn't have much flavor, and wasn't as buttery as I'd like. The chocolate inside was good, but I lamented that there wasn't nearly as much as I wanted, just a single, rather than double, bar. Individually for $6 this was very pricey, but if gotten as part of a pastry basket each item is $4.33, which is a little more reasonable? When I travel, I most often stay at Starwood properties, as I somehow achieved Platinum status due to all my frequent travels. 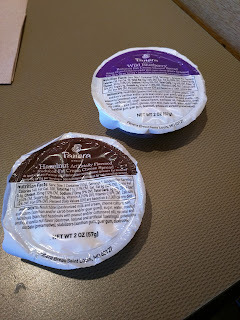 As part of my status, I also can choose to receive free breakfast (or points, or a welcome amenity). I'm a breakfast lover, so, I often pick breakfast, as you've probably noticed by now. My travels took me to Boston this past year, to work from our Cambridge office for a few days before joining my family in New Hampshire. 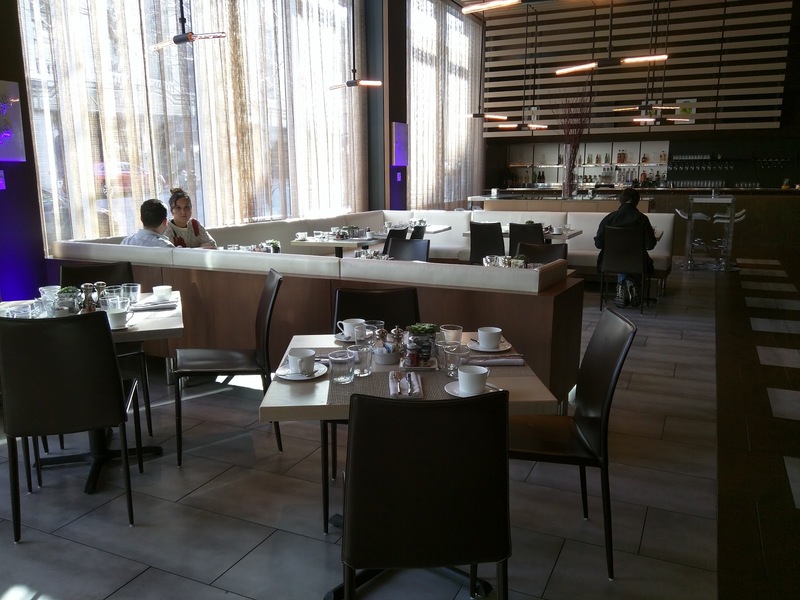 I stayed at the W in Boston, a bit of a walk to the office, but, one I picked because it sounded like it would be much better than the closer options (plus, it was more affordable). The hotel was quite nice, and I'd gladly stay again. 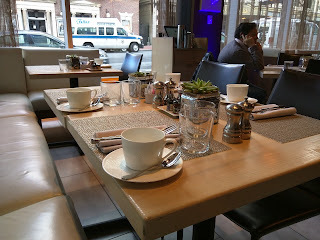 The W Boston was the first time I was given an a la carte option at a Starwood property, as they do not have a buffet nor lounge, just a restaurant, "The Gallery". Except, we weren't actually given an a la carte option, instead, we were told that we had the "Substance" breakfast: 2 eggs, crispy potatoes, toast, bacon/ham/sausage, juice, and coffee, normally $24. I of course did my research and knew that I could opt for a $24 credit instead, and spend it as I pleased, since I didn't really want eggs and toast and um, they had pancakes and baked goods on the menu. So, both Ojan and I were given an allowance of $24 to spend daily, and could choose to dine in, or, as I discovered a few days in, we could get it to go to enjoy either in the comfort of my room, or, on the walk in to the office. The restaurant was fairly inoffensive but totally boring, decor-wise. Brown, beige, and white, no real color anywhere. The lighting, curtains, and accents at least made it not feel sterile, and were clearly done by a designer, but, still, not much zing to the place. The room was made up of mostly tables for 2 or 4, generally chairs, although there were a few higher tables with stools and a few with bench seating. Tables were wooden, had brownish placemats, and cloth napkins. Coffee mugs, water cups, and juice glasses were all set on the tables, along with succulents in pots. Each table also had an adorable mini ketchup, tabasco, honey, and two types of Dickenson's jams, along with salt and pepper shakers, and assorted sweeteners. 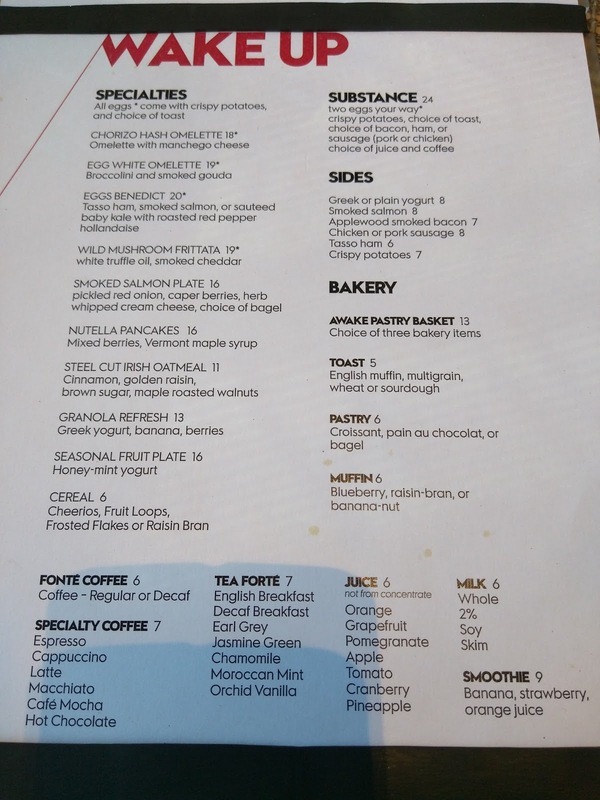 The "Wake Up" menu, in addition to the "Substance" option they seemed to push everyone towards, was also broken into specialities, sides, and bakery, plus assorted beverages. For drinks, there is coffee by Fonte ($6 for drip, $7 for espresso drinks), tea by Tea Forte ($7), assorted juices not from concentrate ($6), milks ($6), and a smoothie ($9). 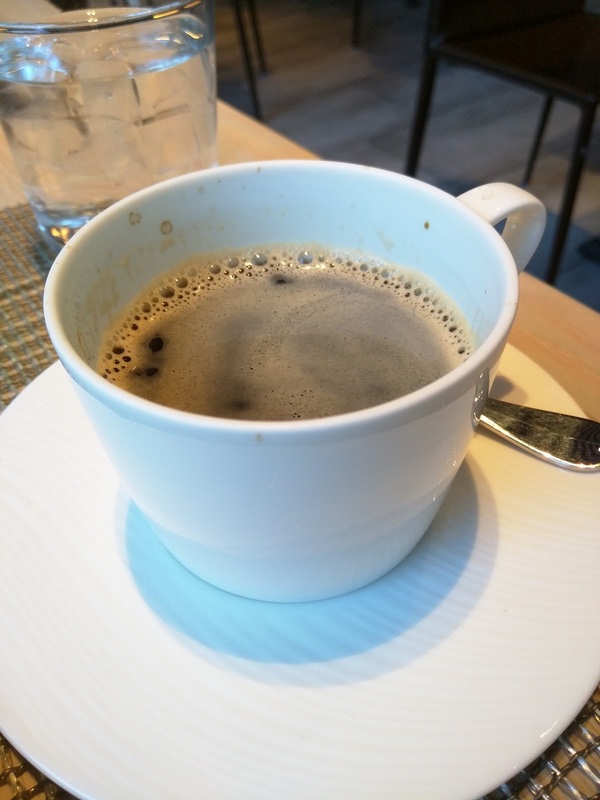 The first day, I opted for a simple decaf coffee. It was poured out of a carafe, and it was rather awful. I tried adding tons of sweetener, I tried thinning it down with water, it was just awful. Nothing saved it. The next day, I asked if they had french press decaf. Nope. So I went for a decaf Americano. It was crazy strong, and not very hot, so I ordered extra hot water to add in, to both warm it up and thin it out. It was better, but still not very good. Finally, the last day, I decided to ditch the coffee, and go for a hot chocolate. I hoped it would be made with milk, maybe topped with some whipped cream. But ... it seemed to just be mix and water. It wasn't rich, it wasn't chocolately, it wasn't good. And $7??!! The juice selection is surprisingly extensive, ranging from classics like orange and apple, to pomegranate, pineapple, cranberry, grapefruit, and tomato. Ojan went for a grapefruit juice one day. It was fine, but, just juice, not fresh squeezed or anything. 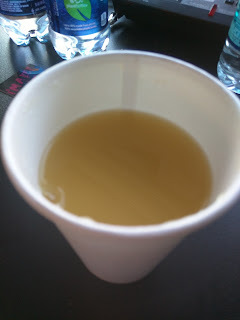 I opted for pineapple juice a few days later, when I had a sore throat, and was really craving cold juice. I actually liked it, it was crazy sweet, and fruity, and what I was in the mood for. Egg dishes all come with crispy potatoes and toast. Options aren't extensive or customizable really, only a single type of omelet (with manchego cheese and chorizo hash, $18), an egg white omelette (with broccolini and smoked gouda, $19), eggs benny (available 3 ways: tasso ham, smoked salmon, or sauteed baby kale with roasted red pepper hollandaise, all $20), and a frittata (wild mushroom, white truffle oil, smoked cheddar, $19). 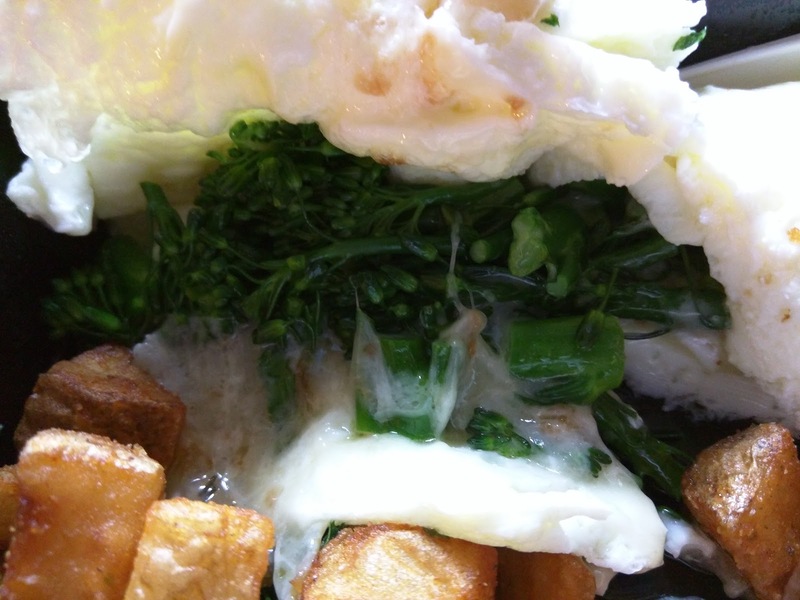 Egg White Omelet / Broccolini / Smoked Gouda / Crispy Potatoes / Toast. Togo. $19. One morning, I wasn't feeling well. Pastries didn't sound good to me (I know, shocker. But, it happens). Pancakes didn't sound good to me. Nothing sounded good. I just wanted something simple and plain. I actually wanted some fruit, but, the fruit plate was composed mostly of melons, plus apples which I don't really like, and since I'm allergic to melons, it wasn't really an option for me. I decided to go out on a limb and get an omelet, even though I don't really like eggs very much. I wasn't feeling the manchego in the regular omelet, so I opted for the egg white omelet, just because I wanted smoked gouda, not because I was trying in any way to be "healthy". The toast I wasn't really planning to eat, but it came with the eggs, and I forgot to say I didn't want it. 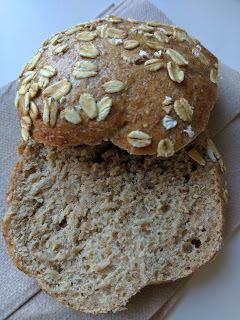 I think I was supposed to get to choose my type of bread, but I wasn't asked what kind, and I think I was given the multigrain. The toast was just generic sliced bread, toasted. 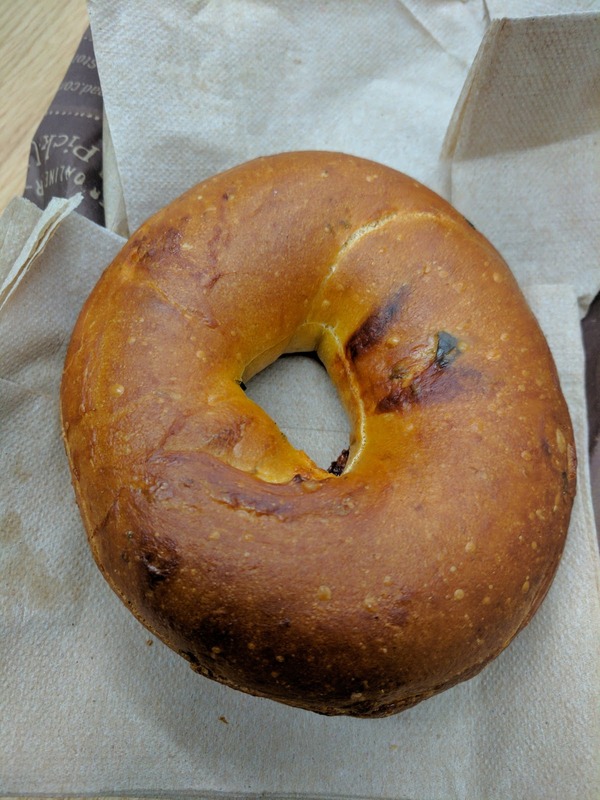 It didn't seem to be buttered, nor was I provided any butter. I wonder if that was because it was the healthy egg white omelet? Or maybe they never butter it? Or maybe they were supposed to give me butter? Anyway, dry toast, even with some strawberry jam, was pretty boring, and I just nibbled a little. The other side included with all egg dishes is "crispy potatoes". They were not crispy. They were soft and soggy and not really warm. They weren't good, even when dunked into ketchup. Did not like. 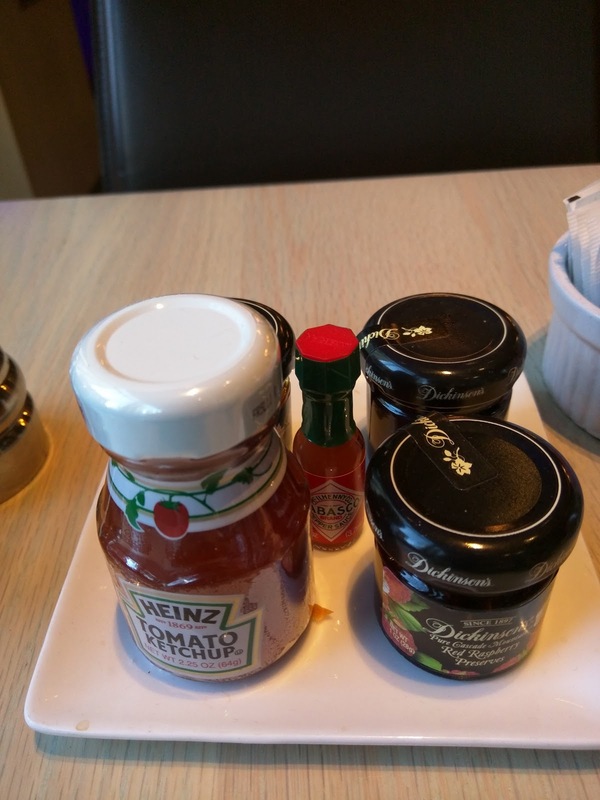 I got my breakfast to go, so I could go crawl back into my room, and my bag also contained one of the mini ketchups, a mini tabasco, and strawberry jam, along with plastic cutlery, salt, and pepper. I appreciated that they included these. As for the omelet, it was ... an omelet. I don't know what I was thinking ordering it. Egg whites, decently cooked I guess, but just egg whites. The broccolini was literally just stuffed inside, not folded into the egg or anything. It too was fine, but, just broccolini. The smoked gouda was decent, smokey, flavorful, well melted. So I guess it was exactly what it should have been, incredibly boring. I wasn't really into it ... at all, but honestly, I don't know what I would have wanted given how sick I was feeling. 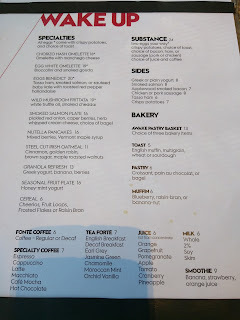 The rest of the menu is the "Specialties", and isn't very extensive nor exciting: oatmeal ($11), granola with greek yogurt and fruit ($13), a fruit plate with yogurt ($16), and basic General Mills cereals (Cheerios, Fruit Loops, Frosted Flakes, Raisin Bran, $6). 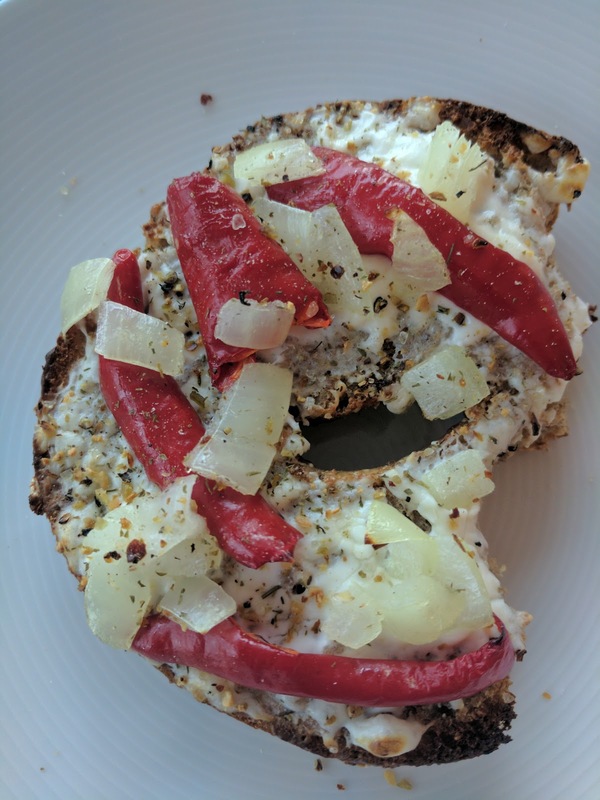 Slightly more interesting is the bagel and smoked salmon plate, with herb whipped cream cheese, caper berries, pickled red onion ($16). 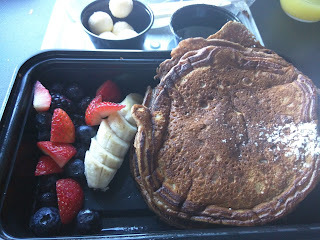 There was only one dish that falls into my favorite category, aka, breakfast carbs (things like pancakes, waffles, french toast, bread pudding): nutella pancakes, served with berries and maple syrup, $16. I obviously order them one morning. I woke up one morning feeling ... healthy. I don't know what was wrong with me. I didn't want pancakes. I didn't want eggs slathered in hollandaise or cheese. I didn't want another basket of pastries. No, I wanted fruit, yogurt, and granola. Really, I think I was somehow imagining that all hotel yogurt would be like the insanely ridiculously best yogurt of my life that I had at the SLS in Beverly Hills (no, seriously. I'd go back to LA, just to go to that hotel restaurant, just to have that yogurt again. Its mind blowing!). So, I ordered the "granola refresh", along with a side of sausage (more on that to come), because, really, who are we kidding, no matter how healthy I feel, I'm not ever just going to get yogurt and granola! It was ... well, yogurt and granola. 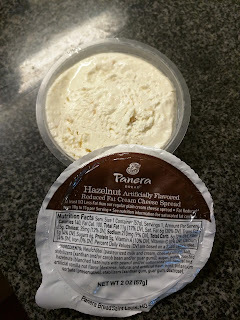 Very generic, thick, tangy Greek yogurt, likely Fage or similar. Not sweetened, not whipped, not infused with vanilla, just straight from a container. On top was standard granola, clearly not housemade. Since the rest of the cereals are General Mills brand, I assume it was too. No interesting seasoning, no clumps, just granola and hard-as-rock raisins. 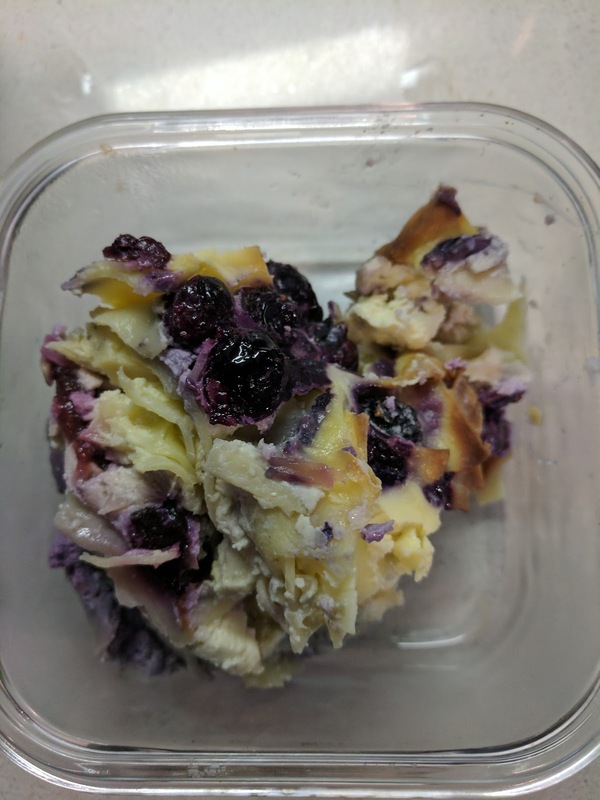 The fruit was a mix of blueberries, raspberries, blueberries, and strawberries, all incredibly lackluster, as it was the middle of winter. Oh, and a sliced up half a banana. I drizzled the honey from the table on top in hopes of improving things, but it didn't really help. I ate the fruit, and I devoured my sausages, but the yogurt and granola really weren't for me. If you like plain, basic yogurt and granola though, by all means, there was nothing wrong with it, it was just clearly not anything I ever should have ordered. Nutella Pancakes / Mixed Berries / Maple Syrup. $16. On my last day, I finally managed to order the pancakes. I love my breakfast carbs, but didn't have time during the week to stop and have a slower paced pancake breakfast (besides the day I wasn't feeling good). Plus, nutella isn't really my thing, so I wasn't super excited about the single pancake option. And no whipped cream? Boo. But still, pancakes. 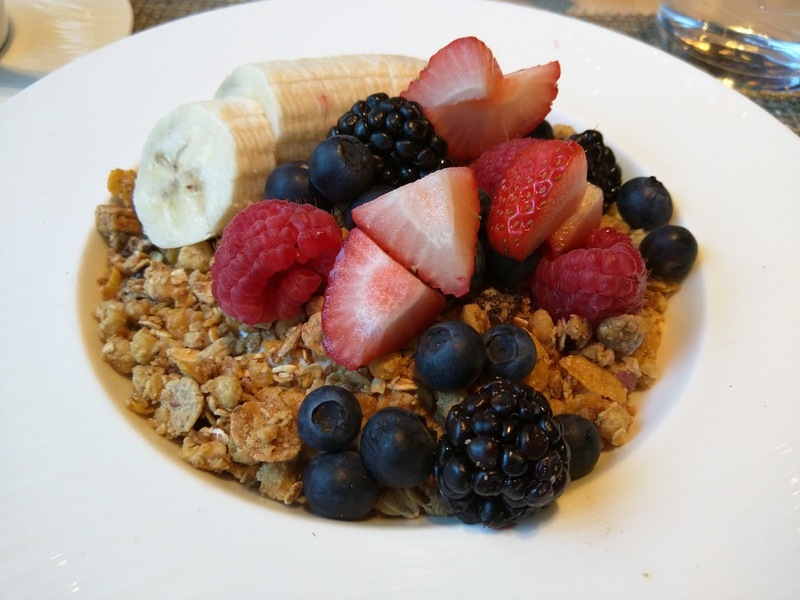 The fruit on the side was the same mix as served with the granola: blueberries, strawberries, blackberries, and sliced banana. It was the same level of not particularly good. The pancakes were large, a stack of 3. They were kinda gummy, kinda soggy, thin, and not particularly good. I guess they did have some slight nutella flavor, and were dark brown, but, otherwise, not great. I expected some Nutella spread on the side, or at least some whiped cream or something. On the side I had a container with balls of butter and syrup. I'm fairly certainly this was not real maple syrup, it was too sticky. Not very good. Overall, a disappointment, and besides the fruit, I didn't each much of it. Luckily, Ojan opted for yet another "pastry basket" (more on that soon), so we had plenty of muffins to share. The "Bakery" section of the menu offers up $5 toast (and no, not the hip SF version, actually, just toast) and $6 bagels, pastries, and muffins. The pastry selection is limited to only croissants (plain or chocolate). 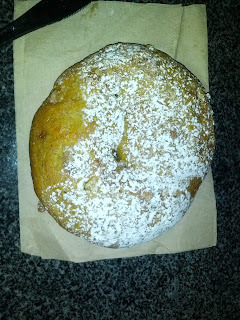 The muffin line up features blueberry, raisin-bran, and a seasonal choice (banana nut at the time of my visit). This was a pretty lackluster sounding "bakery" to me, as I was expecting to find scones and danishes, perhaps some cinnamon buns ... 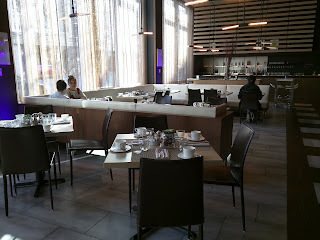 But, given the low traffic the hotel sees for breakfast, and the lack of buffet, I guess I couldn't really expect them to have an extensive line up. I didn't really expect that any of these "bakery" items would be great, but, you know me and baked goods, how could I resist? Turns out, not resisting was a great move. Awake Pastry Basket To-Go: Raisin Bran Muffin, Blueberry Muffin, Pan au Chocolat. $13. For my first pastry "basket", I opted for my first choice of pastries, the blueberry muffin. 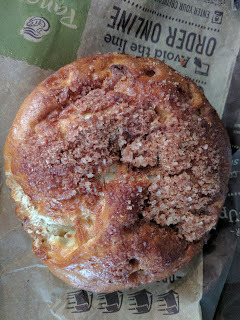 I also selected a chocolate croissant, in order to mix it up in case the muffin wasn't very good. Finally, I threw in one more selection, my last choice of muffin, raisin bran. This may seem a bit odd, but it was very strategic. Since a basket of 3 pastries was only $1 more than buying two individually, and I had the money included in my package, I went for the 3, obviously. I was planning to get at least two (in case one wasn't good, plus, I like to try all the things). I wanted to hedge my bets between the muffins and croissants. And, still not expecting generic hotel pastries to be good, I threw in my last choice, just so I could try it, and get my curiosity out of the way. 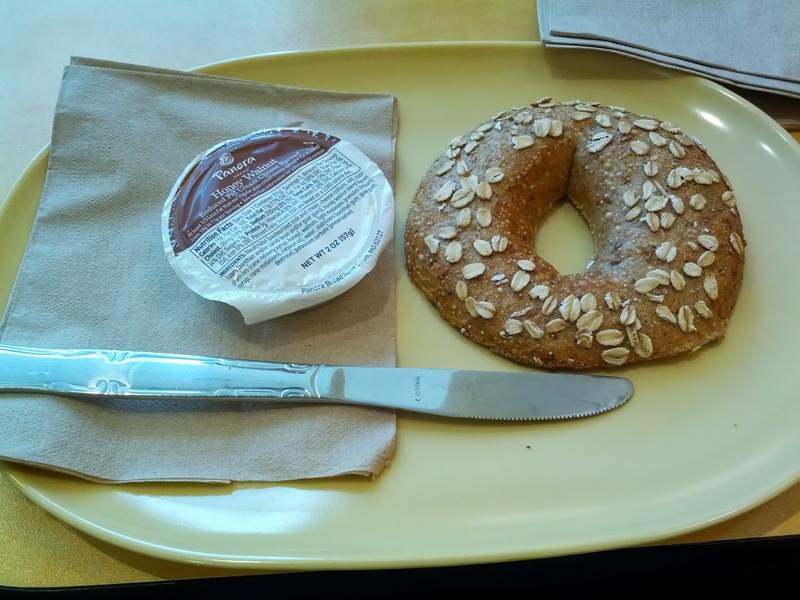 Plus, I thought that maybe the basket was mini sizes rather than full, because really, what kind of breakfast is this? Who orders a basket of these for breakfast? As you can see, these weren't mini. I laughed when I opened my bag to find my three, very large, pastries all smushed into the togo box together. I wondered if when served at the restaurant they came in more of a "basket"? I also thought "woah, what did you get yourself into, these are huge!" 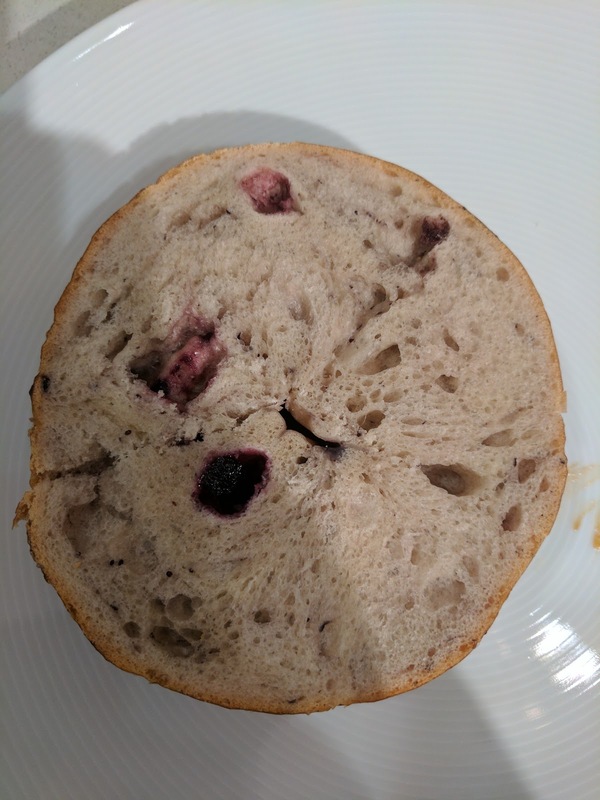 I started with the blueberry muffin. I took one bite, and stepped back, surprised. Woah, where did this come from? It was really, really good! The top had a sweet streusel crumble. I'm such a sucker for streusel. It was crispy on top, just how I like. Inside was moist and dense, although perhaps a little bit oily. 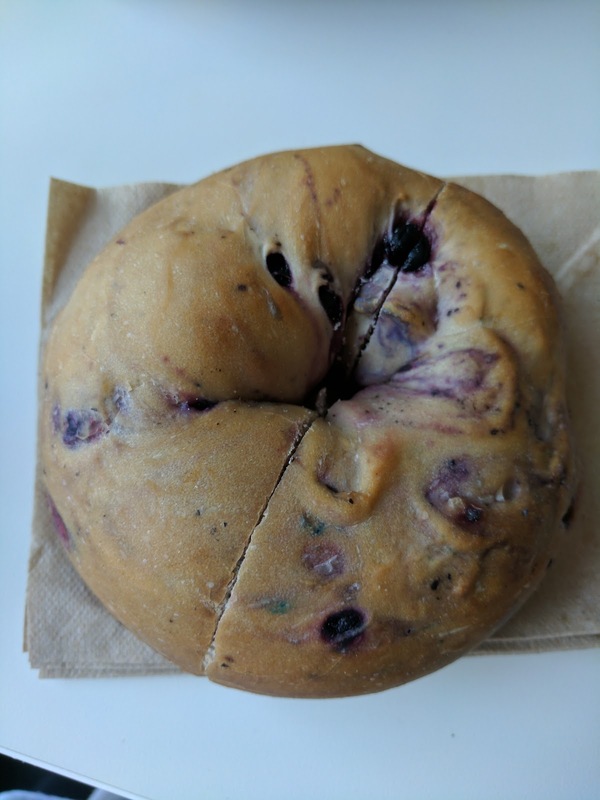 The blueberries inside were very flavorful, plump, and juicy, although there weren't tons of them. Overall, really quite good, and they nailed the topping in particular (sure, it could have been less oily, and have more blueberries). I quickly moved on to the raisin bran muffin. 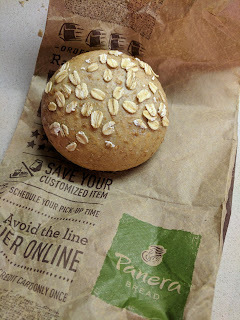 It didn't have a streusel, but instead had an oat topping. It too had a crispy top as I like, and was moist and dense inside, although again, a slightly too oily. And, just like the blueberry muffin, the raisins were super plump, although again, like the blueberry, there weren't tons of them. The base flavor had a complex sweetness to it, sorta like molasses. Another quality muffin. And finally, the pan au chocolat. 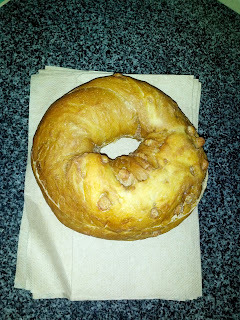 I'm not a huge fan of croissants, and always go for almond or otherwise filled, but again, I was just hedging my bets. The croissant, like the muffins, was well executed. The outside was crispy. Inside was clearly defined layers, and it was moist. It wasn't dried out at all. The chocolate was quality dark chocolate, although, there wasn't tons of it. Still, a good croissant. Let's just say I was blown away. These were all good, and clearly freshly baked. 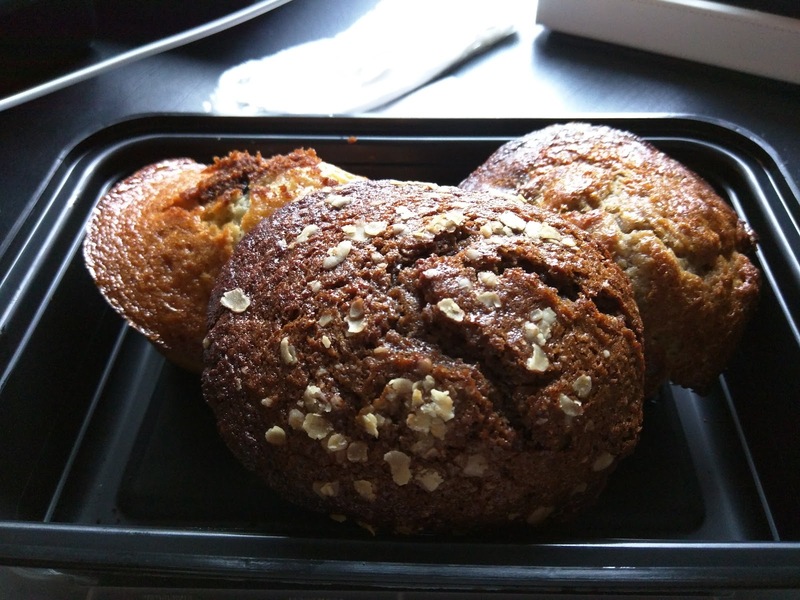 Awake Pastry Basket To-Go: Raisin Bran Muffin, Blueberry Muffin, Banana Nut Muffin. $13. 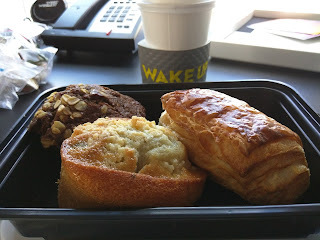 The first day I got my pastry basket, Ojan went down on his own, and ordered just one muffin and one croissant. 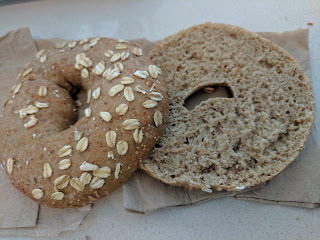 Once I explained that for $1 more he could have a third item, and that it easily fit in our daily allowance, so the next day he opted to do so, and had me pick up his "basket" of muffins, along with a grapefruit juice. Of course, I may have "helped" him out with some of these. 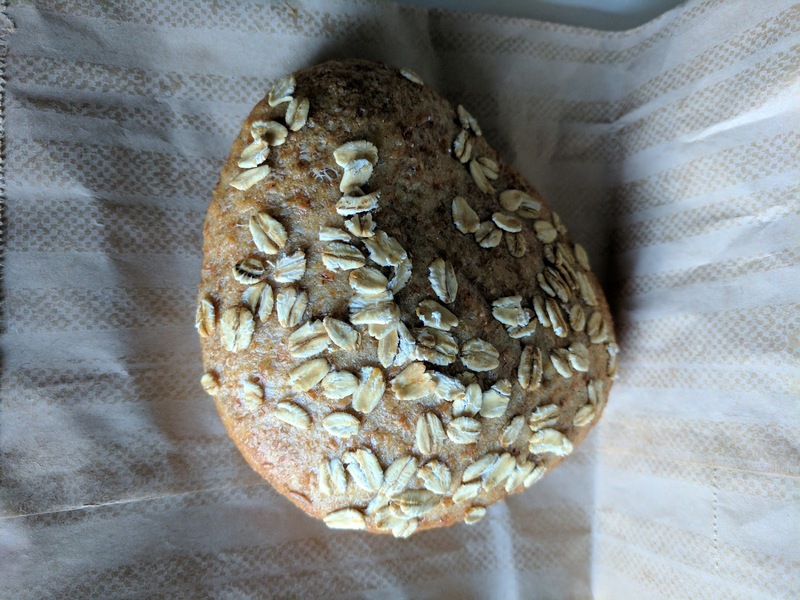 The raisin bran muffin was about the same as the day before, still a little too oily, but otherwise had a great flavor, and nice plump raisins. I didn't try the blueberry, as it is his favorite and I had it the previous day, and he gobbled it up. 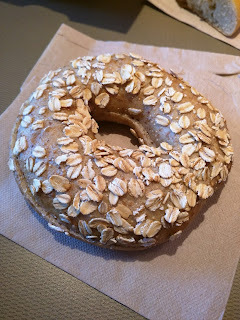 The banana nut turned out to be my favorite, and I immediately planned to order it myself again the next day. Moist, good banana flavor, crunchy nuts, crispy top. And of course, I did order the banana nut again (and again, and again). Definitely my favorite of the muffins. 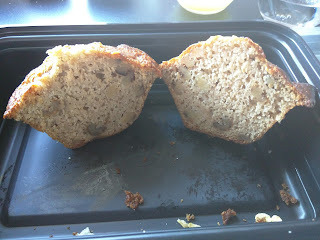 Crispy top, coated with sugar, moist interior, lots of nuts, banana flavor not to overwhelming. Hands down favorite. One morning, all of my muffins arrived cut in half. I'm not sure why, but, it enabled me to take close-up photos of the interiors, before I devoured them. 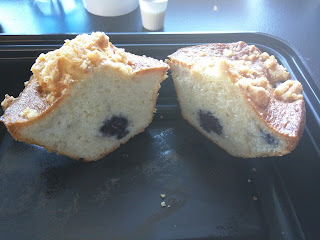 The blueberry muffin was always my second choice; I loved the streusel, the crispy top, and the moist decent base. As I said before, the blueberries were huge, plump, and quite tasty, but here you can see illustrated my complaint that there were not many blueberries inside. The raisin bran was always my third choice, but one I was happy to eat. It always had the oats on top, a molasses flavor to it, and plenty of raisins. I wished I had tasty jam to slather on it. But my favorite was always the banana nut. Sugar on top, super crispy on top, moist inside. Loaded up with walnuts, for extra crunch, and the banana flavor was never too overwhelming. The final section of the menu is sides, such as plain or greek yogurt ($8), smoked salmon ($8), bacon ($7), sausage ($8), ham ($6), and potatoes ($7). So, little known fact. I love sausage. Ok, not all sausage. In fact, I don't really like sausages like you'd eat for lunch in a bun with toppings, I only like breakfast sausage, or crumbled sausage in pasta or on pizza. I prefer patties, but a thick link with a crispy outside can be good too. And, I like pork sausage, even though I don't really like many other pork products (other than bacon, pork belly, and uh, mortadella). Heh, we can't control what we like, can we? Anyway, to hedge my bets with the yogurt/fruit/granola dish, and to spend my full $24 credit, I added a side of sausage. I had no idea what to expect, as it could be anything from a single sausage patty on the side, to a pile of greasy thin links. 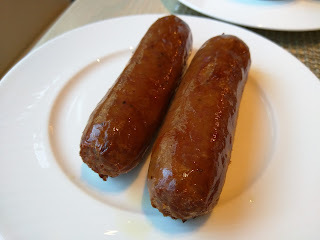 I was quite pleased my when side arrived, 2 large, glistening, crispy sausage links. The sausages were quite tasty. Super crispy on the outside, just how I like. They were thick and juicy. Breakfast sausage style, so mildly seasoned. Very large. 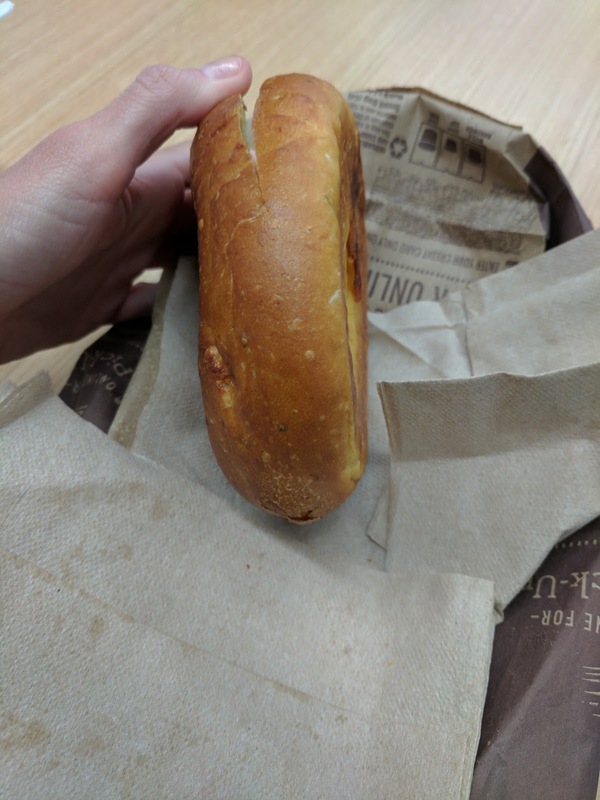 The serving of 2 of these was bigger than a regular lunch sausage, and really should have been split with someone, but, uh, I really liked my sausage, and had no one to share with. How could I let this deliciousness go to waste? I really love breakfast sausage drizzled with maple syrup, but I didn't have any (it comes with pancakes, so I'm sure I could have ordered some, but that certainly would have broke the bank!) It was fine on its own, and easily devoured, but some syrup would have pushed it over the top. It wasn't without faults though, as the sausage really was way too greasy. After the success of the sausage, I decided to go for bacon the next day when I was ordering to go. The portion was 5 strips, slightly more modest than the two large sausages. 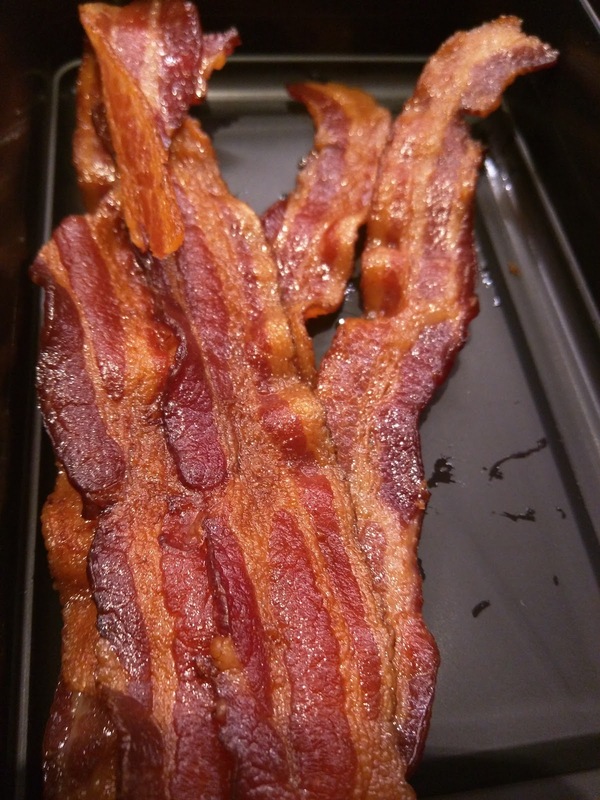 It was crispy, decently cooked bacon, but pretty greasy. It didn't seem to have been drained. 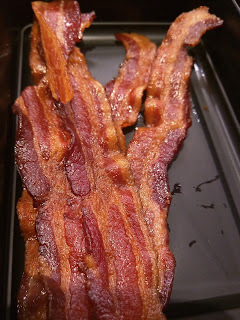 I liked the crispiness, I liked the salt level, but, it was just bacon, nothing earth shattering. $7 price was slightly lower than the sausage, but a bit crazy if you think about it as just 5 strips of bacon.